Not able to make it to Churchill Downs for the Kentucky Derby? Embrace the spirit with this Blackberry Mint Julep Smoothie, a healthy Shakeology version of the classic Southern cocktail. 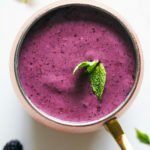 This Mint Julep-inspired smoothie blends Vanilla Shakeology with blackberries, fresh mint leaves, and bourbon extract to taste like a fruity version of the classic cocktail. The Mint Julep-inspired smoothie blends Vanilla Shakeology with blackberries, fresh mint leaves, and bourbon extract to taste like a fruity version of the classic cocktail. Place water, ice, Shakeology, blackberries, mint, and extract in blender; cover. Blend until smooth.